With an army of brave knights you can Storm The Castle, my liege. Click here to play! Our men-at-arms are the best trained, our armour is of the finest quality, and our swords are forged by the best smiths in the land. Lead us to battle, sire, and we will Storm The Castle to win the day. In the Storm The Castle classic 3-reel slots game, you must line up knight helmets, kite shields, target shields and BAR symbols to claim the prizes within the enemy fortress. 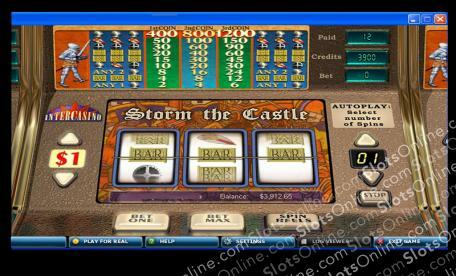 Pretend you are the mightiest king in the land, and play the Storm The Castle slots for riches and glory.